RhinoCAM is a Computer Aided Machining (CAM) plug-in for CNC that runs completely inside of Rhinoceros 5.0. This plug-in is a general purpose machining program targeted at the general machinist. 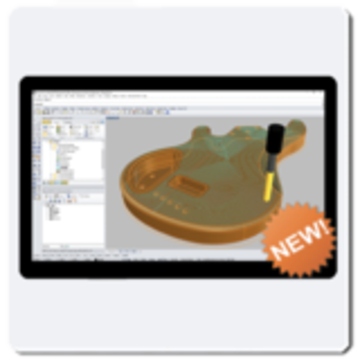 RhinoCAM marries the power of Rhino's freeform modeling with the legendary machining capabilities of VisualCAM to bring you a product of unrivaled capability for free form surface machining. RhinoCAM is a Computer Aided Machining (CAM) plug-in for CNC that runs completely inside of Rhinoceros 5.0. This plug-in is a general purpose machining program targeted at the general machinist. RhinoCAM marries the power of Rhino's freeform modeling with the legendary machining capabilities of VisualCAM to bring you a product of unrivaled capability for free form surface machining. With the seamless user interface, selection and display integration RhinoCAM acts and feels like you are working with Rhino when creating your cutter paths. RhinoCAM is fully associative to any geometry changes within Rhino. A program tailored for hobbyists, makers and students. Ideal for getting started with CAM programming. Includes 2 & 3 axis machining methods. Packed with sufficiently powerful manufacturing methods this easy to use package is not only effective but also attractively priced for the budget conscious or entry level buyer.